Organisers of the 2015 Rugby World Cup had a "moral obligation" to use more rugby stadiums as venues, says ex-Rugby Football Union chairman Martyn Thomas. Only three rugby grounds - Kingsholm, the Millennium Stadium and Twickenham - have been included on the long list of venues for the tournament. "It's a great shame, I'm very disappointed," said Thomas, chairman when the RFU won the hosting rights. "There was a moral obligation to use more rugby stadiums." There was particular controversy over the omission of Leicester's Welford Road, with tournament organisers deciding that Leicester City Football Club's King Power Stadium is a more appropriate venue. Thomas, who stepped down as RFU chairman last November, led England's winning bid for the competition and became chairman of England Rugby 2015, the body set up to plan and deliver the tournament. He relinquished his duties with the latter when he vacated his role at the RFU. Welford Road was included as a venue in the RFU's bid tender and Thomas believes it was wrong for it to be omitted. "Welford Road is a great venue and I think we've lost the chance to develop rugby clubs," he added. "We wanted rugby stadiums. The great thing about Welford Road is that the Leicester faithful would have turned out even to watch a game between minnows. "For a game such as Japan against Fiji for example, there's not a lot of point putting it in a stadium with a capacity over 20,000." The list of 10 to 12 venues will be finalised early in 2013, after the tournament match schedule has been formulated. The stadiums that are selected to host games will be able to levy a "hire charge". Tournament organisers England Rugby 2015 must sell 2.9m tickets to cover the £80m guarantee owed to the International Rugby Board. Andy Cosslett, ER2015 chairman, said: "We are confident that, with the venues selected, we will be able to reach our target of having up to 2.9m tickets available - opening up the tournament to more people than ever before and in turn delivering the biggest and best Rugby World Cup there has ever been." 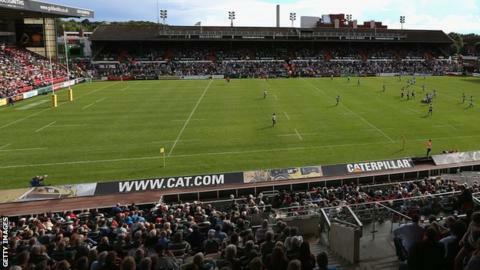 RFU chief executive Ian Ritchie said Welford Road had not met the necessary criteria to stage matches. "They do a great job, they are a fantastic club," he said. "I can understand their disappointment but I think you've got to look at what were the facts of the review and the audit that went on."